The Net Mums Community Facebook page (a great source of support for peanut and nut allergies) recently posted an interesting publication from the Resuscitation Council (UK) entitled “Frequently asked questions on Emergency treatment of anaphylactic reactions – Guidelines for healthcare providers“. This document was last updated in May 2014 and states “most people who require an adrenaline auto-injector should be prescribed one device” – save for a few exceptional circumstances. 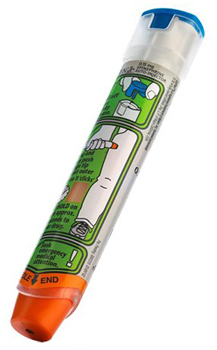 However, the Anaphylaxis Campaign recently made us aware of the Medicines and Healthcare Products Regulatory Agency (MHRA) publication, also dated May 2014, entitled “Adrenaline auto-injectors: advice on use” which clearly states that you should “carry two adrenaline auto-injectors with you at all times”. These two documents clearly contradict each other. We cannot say that one is out of date – as they were both released in May 2014. So what is going on? Who is the authority on this matter? Who makes the decision and is it based on clinical need or cost? Personally I would never be without two Jext/EpiPens for my peanut allergic son – if the mechanism fails (rare), is administered incorrectly or the ambulance takes more than ten minutes to arrive and the patient still cannot breath, you may need to administer a second shot. Sadly I do feel that we have a severely fragmented, inconsistent and contradictory allergy service in the UK and someone needs to get a grip of the problem and have full oversight and – more importantly – overall responsibility for what is going on.